A plum 99-year leasehold residential site in posh Bukit Timah Road has been put on the market at a minimum price of $448.8 million. The reserve list plot known as Fourth Avenue was triggered for sale when a developer offered the minimum price. The Urban Redevelopment Authority (URA) said yesterday the tender will be launched at a later date. The 18,532 sq m district 10 site, which is near two good-class bungalow estates, appears to have drawn strong interest, with as many as 15 developers expected to throw their hats into the ring. It has a land area of 1.9ha and a maximum permissible gross floor area of 33,358 sq m, so it could yield 455 units. ZACD Group executive director Nicholas Mak said: "The land rate of $1,249.92 psf ppr (per sq ft per plot ratio) for Fourth Avenue is very close to the trigger bid of $1,250 psf ppr for the site of the former Zouk in Jiak Kim Street." Edmund Tie & Company research head Lee Nai Jia said there has been much interest in the site, as it is near the Sixth Avenue MRT station and good schools. "Based on current market conditions, we expect the winning land bid to be around $567 million ($1,580 psf ppr)," he added. Two other land parcels were also put up for tender under the Government Land Sales programme yesterday. A site in Chong Kuo Road was launched for sale under the confirmed list, while one in Cuscaden Road was made available for application under the reserve list. A Toh Tuck Road site tender near the Bukit Timah housing district attracted a record 24 bids in April, with Malaysian developer SP Setia securing the 99-year leasehold plot for $265 million, or $939 psf ppr. Two other land parcels were also put up for tender under the Government Land Sales programme yesterday. A site in Chong Kuo Road was launched for sale under the confirmed list, while one in Cuscaden Road was made available for application under the reserve list. These two sites could yield about 250 residential units, the URA said yesterday. 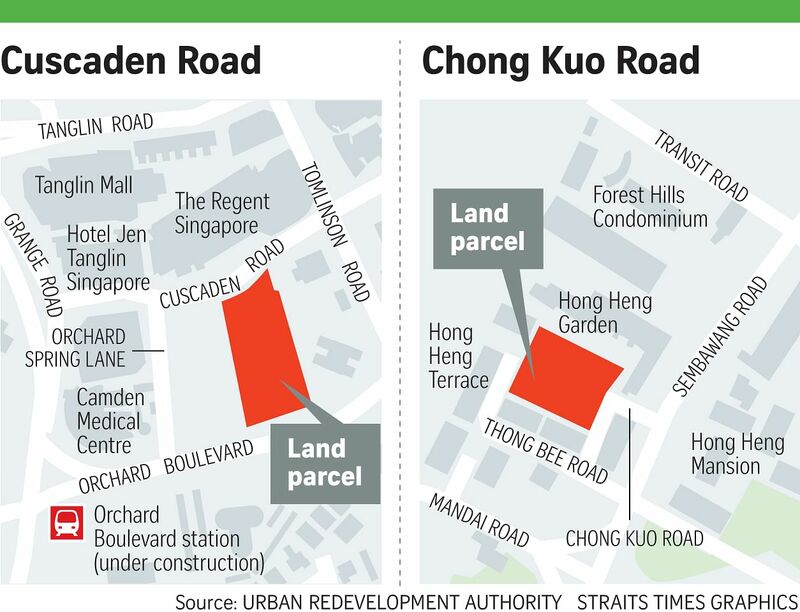 The tender for the 4,282.9 sq m Chong Kuo Road site will close at noon on Jan 30. It is timed with the tender closing for two other residential sites - in Handy Road, which will be launched for sale this month; and the Sumang Walk executive condominium plot, which will go on the market next month. The 99-year leasehold site in Chong Kuo Road has a maximum building height of five storeys, which translates to a permissible gross floor area of 5,997 sq m. It is near Sembawang Country Club and Orchid Country Club. There is a maximum building height of 100m and a permissible gross floor area of 16,024 sq m for the 99-year leasehold parcel in Cuscaden Road. The 5,722.6 sq m site is near Orchard Road, the upcoming Orchard Boulevard MRT station and the Botanic Gardens. Mr Ong Teck Hui, JLL's national director for research and consultancy, said the two sites are unlikely to slow the collective sale bandwagon as there is still pent-up demand. He believes the Chong Kuo Road site will likely attract smaller firms, with the top bid expected to be "between $570 psf ppr and $650 psf ppr". "The Cuscaden parcel, if triggered, will be a test of sentiments in the upper prime market. It could fetch a top bid of $1,600 psf ppr to $1,800 psf ppr," he said. ZACD's Mr Mak said that if the Cuscaden site is launched for sale by tender in the next two months, the estimated land price would range from $250 million to $270 million ($1,450 psf ppr to $1,565 psf ppr). "Due to the limited new supply of private non-landed residential units in the vicinity, this tender would draw strong interest from many developers," he said.